I'd often heard about women who turn to natural cosmetics when faced with with skin care conditions or during recovery from cosmetic procedures. Some cosmetic lines even cater to dermatologists, such as Oxygenetix. They offer a foundation designed to promote healing while offering complete coverage. Read on for my thoughts on this product. 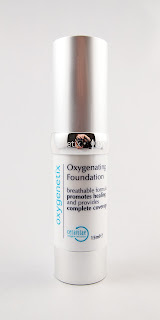 Oxygentix Oxygenating Foundation does more than your usual foundation. It is designed to help heal the skin, so those who have skin conditions or are recovering from procedures may want to give it a try. However, I tested it on my fairly healthy skin, so I wasn't able to determine the full benefits on normal skin. What I did find is that it is more water-resistant than traditional foundations, which makes it a good choice for underwater shoots, water sports, and/or weddings (due to its resistance to tears and rain). The coverage is medium to heavy. The foundation is priced fairly high (around $66), so it seems targeted towards those who need it for a specific purpose (such as healing). Aside from the high price, the only other drawback I noticed was the color range, as the lightest color in the blue range was still a couple of shades too dark for my fair skin. Like other natural foundations, I did appreciate seeing recyclable packaging and a fairly gentle ingredient list. I was pleasantly surprised to see that this foundation rates around a 2 on EWG's Skin Deep database, which is pretty low. Many of the ingredients may sound unfamiliar, but this foundation was clearly created with safety in mind. If you have had a cosmetic procedure and need something gentle or have a skin condition, Oxygenetix's foundation may be worth a try.